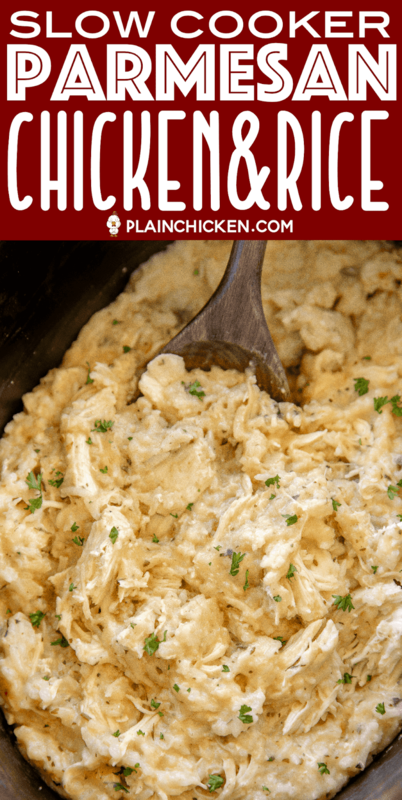 Slow Cooker Parmesan Chicken and Rice - a quick and easy weeknight recipe! Just dump everything in the slow cooker and dinner is done! Only 5 ingredients - chicken, Lipton's Garlic Soup mix, cream of chicken soup, milk and rice.Can add some mixed veggies too! Everyone cleaned their plate! Leftovers taste great too! YUM! I am a big fan of slow cooker meals. I love dumping everything in the slow cooker and coming home to dinner. This Slow Cooker Parmesan Chicken & Rice is one of our favorites. It is SO easy and SOOOO delicious! 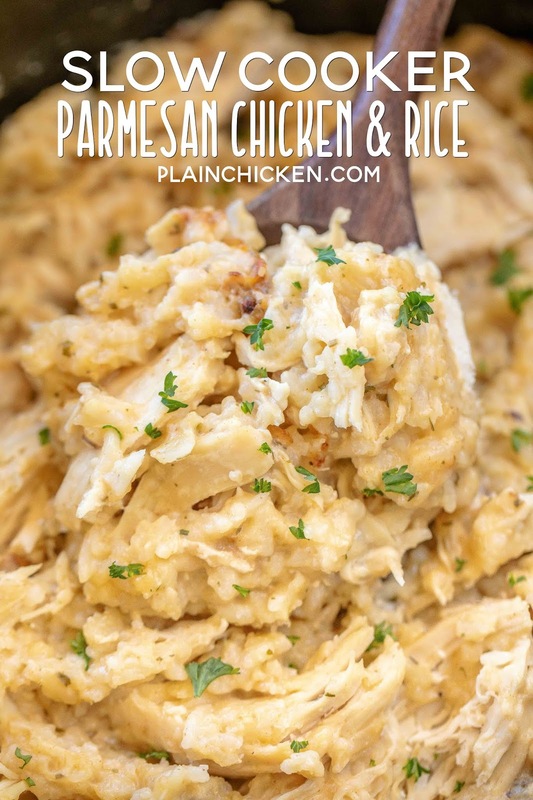 Chicken and Rice with garlic and parmesan - all of my favorites in one dish! This makes a lot of chicken and rice. I shredded my cooked chicken and stirred it back into the rice. You can also leave the cooked chicken breasts whole and just serve them with the cooked rice. Either way is fine. I just prefer finding chunks of chicken in my cheesy rice. 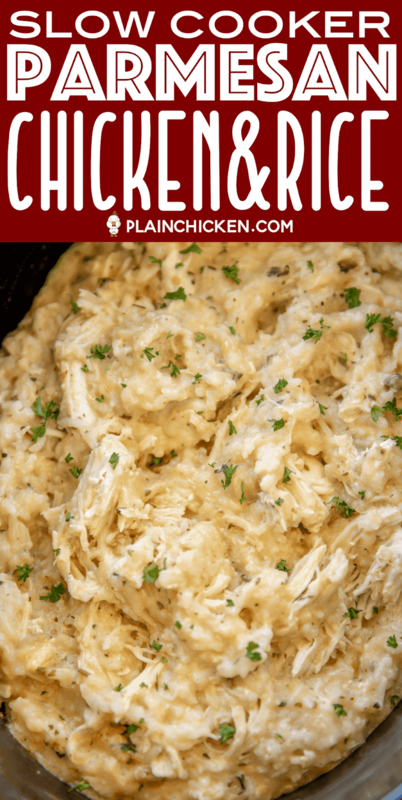 We LOVED this cheesy chicken and rice! 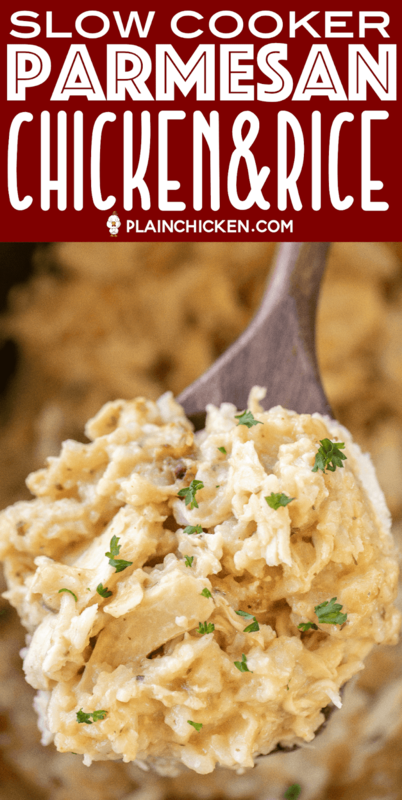 It tastes great right out of the slow cooker or leftover for lunch the next day! It reminded me a lot of chicken risotto. 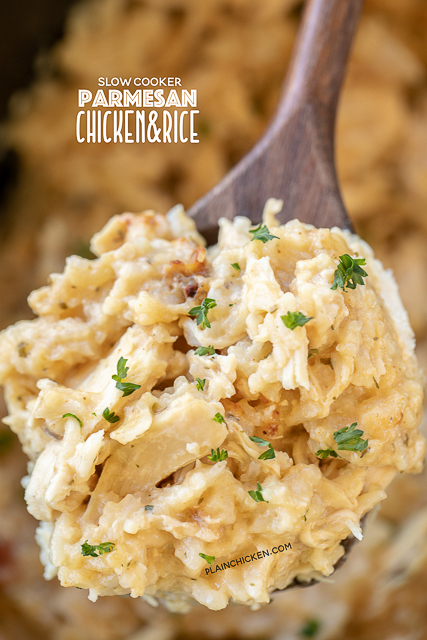 I happen to LOVE chicken risotto, so this is right up my alley. Put it on the menu ASAP!!! 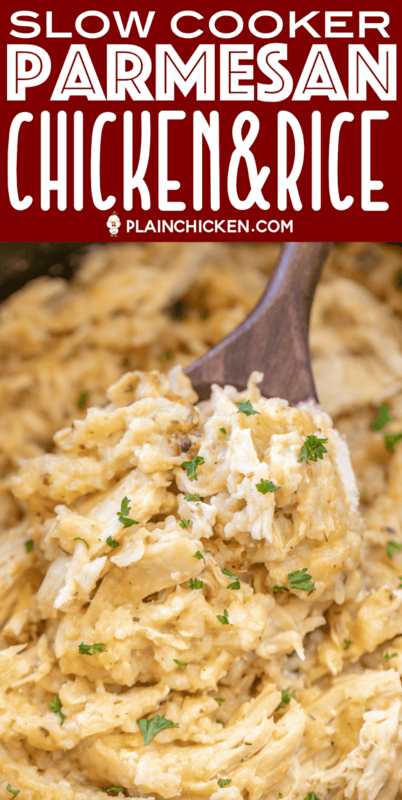 This Slow Cooker Parmesan Chicken & Rice is super easy to make. Spray the slow cooker insert with cooking spray and lay the chicken in the bottom. You will need 3 or 4 boneless chicken breasts, just depending on their size. You are shooting for about 2 pounds of chicken. Next mix together the soup mix, cream of chicken soup, milk and rice. Pour over the chicken. Cover the slow cooker and let it work its magic! If you feel like the chicken and rice mixture is too thick, feel free to add some chicken broth or extra milk to thin it out. Feel free to throw in some frozen mixed vegetables too. YUM! 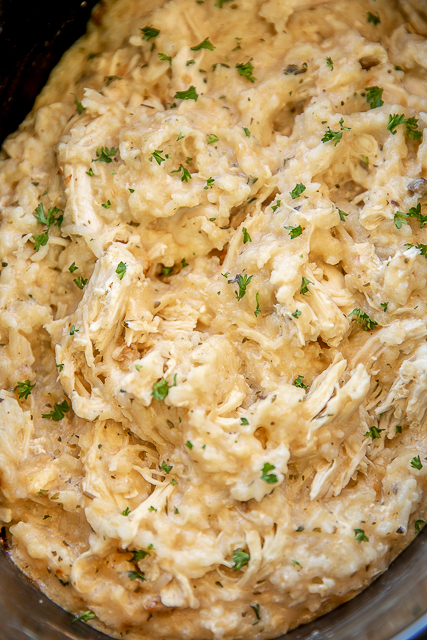 This Slow Cooker Parmesan Chicken & Rice uses a packet of Lipton's garlic soup mix. It will be next to the Lipton's Onion Soup Mix at the grocery store. Please note, you are only going to just use the mix. Don't make the soup. Also, make sure to use regular long grain rice, not instant. If you use brown rice, you will need to adjust the liquid and and cooking time. Spray the insert of the slow cooker with cooking spray. Place chicken in bottom. Mix together cream of chicken soup, Lipton Garlic Soup Mix, milk and regular rice. Season with salt and pepper, if desired. Pour over chicken. Sprinkle parmesan cheese on top of rice mixture. Cover slow cooker and cook on LOW for 8 hour or HIGH for 4 hours. Remove chicken from slow cooker and chop. Place back in slow cooker and stir to combine. Could you use frozen chicken breasts or do they need to be thawed prior to going in the crock pot? Can i use bone in chicken thighs? I haven't tried this with bone-in chicken thighs, but it should work just fine! Enjoy! When would you add the veggies? If adding frozen peas, add them at the end. They only need a few minutes to cook. If adding some frozen mixed vegetables, you can add them at the beginning or at the end and cook for 15 to 30 minutes. Do you think jasmine rice would work okay? I would think it would be fine. I love my crock pot and I am sure it is lonely since I got my IP for Christmas. Have you tried this recipe in the IP? I have not made this in the Instant Pot. You can certainly use the slow cooker setting on your IP if you wish. Oooooh! I haven't pushed that button yet. Ty!! Is there anything that can be substituted for the cream of chicken or is it necessary? Trying to keep sodium level down for my mother's blood pressure. Made it with what I had. Used cooked, chopped turkey. Added some frozen broccoli and sliced carrots. Added about 1/2 cup of water and baked in a 9x13 pan at 375 for an hour and 15 minutes. Delish! Can't wait to get some chicken breasts and make it in the slow cooker.